Will Precious Metals Rally This Fall? Is It Rally Time for Precious Metals This Fall? 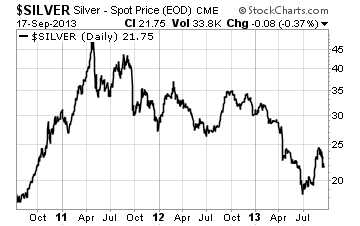 In the late summer, precious metals prices finally reversed and broke out to the upside, led by silver. Some metals investors may understandably be skeptical of this recent rally and whether it can be sustained. After all, the markets have produced a number of false starts over the past two years. Notwithstanding the continued softness in recent weeks, we believe a sustainable, multi-month rally in precious metals prices is indeed approaching. Nothing is ever certain when it comes to the future direction of asset markets – especially in an environment where all assets are tied to the "wild card" of large-scale interventionism from the Federal Reserve. But the odds are now in our favor for the intermediate-term and long-term. after more than 2 years of decline. In the near-term, markets can rise or fall on the news-driven ebb and flow of "dovish" and "hawkish" expectations for Fed policy. Gold and silver prices retreated in September ahead of the Fed's widely expected tapering of its bond-buying program. In a previous Federal Reserve policy meeting statement, Fed officials indicated their outlook for economic growth had changed from "moderate" to "modest." Markets moved on the hypothesized meaning behind the subtle shift in terminology. And when the Fed backed off its "tapering" plans in September, gold and silver rallied, only to fall back again in the past few days on concerns about the nation's borrowing limit. These incessant word games and most of the other day-to-day "noise" you hear in the financial media will prove to be irrelevant in the big picture. What will matter to you years from now are things like how many ounces of gold and silver you hold. Will you be glad you had accumulated more ounces when opportunities presented, or will you curse yourself for having sat on the sidelines? Now remains a favorable time for accumulation. The cyclical lows for the precious metals appear to be in. But even if some further downside remains, the upside potential from wherever the final lows are established is immensely greater. We have signs of extreme stresses in the precious metals markets. Over the summer, the gold market slipped into a condition known as "backwardation." Prices enter backwardation when spot and near-dated futures prices are more expensive than longer-dated prices. This unusual condition for gold has presaged major rallies when it has occurred in the past (1999, 2001, and 2008). Some analysts say gold's long period of backwardation in recent months also suggests rising fears of default on the futures exchange (since investors are willing to pay a slight "insurance" premium in order to obtain gold for immediate delivery). dramatically, as physical metal is shipped to Asia. 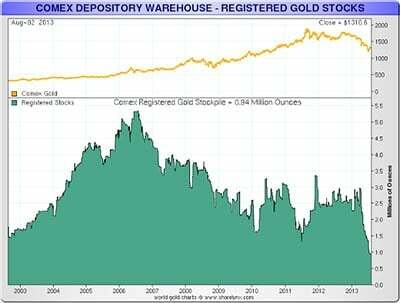 As shown on the chart to the right, physical inventories on the Comex have plummeted over the past several months. It's always been the case in the leveraged futures markets that claims on physical gold are multiples of available supply. But now supplies are getting so tight that a "run on the bank" is a real possibility, according to some insiders. A recent research report by Monument Securities put it this way: "The gold market is a gigantic fractional reserve system consisting of a vast quantity of paper claims to gold bullion and a much smaller inventory of actual bullion." Fractional-reserve banking works as long as depositors don't withdraw their funds in large numbers. Fractional-reserve gold functions on the same premise – that the vast majority of people with contractual claims on gold won't actually demand to be paid in gold. Investors who own derivative products instead of the real thing are assuming greater risk. Moreover, the people who hold futures contracts, exchange-traded products, unallocated pooled accounts, and other indirect plays on precious metals are helping the paper pushers divert demand away from the actual, physical product. The good news for precious metals bugs (which is, in turn, alarming for "paper bugs") is that even as futures markets sold off heavily earlier this year, demand for bullion products – especially silver coins – soared. 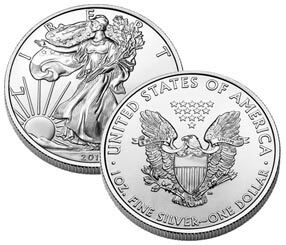 For example, sales of 2013 Silver Eagles by the U.S. Mint surpassed 2012's numbers before the end of August. And China accumulated more than 706 tonnes of gold in the first half of 2013, up 54% from the same period last year. As the London Telegraph reported in August,"Ownership of the world's gold shifted further East during the first half of 2013, as Westerners dumped their exchange-traded holdings and, on the other side of the globe, Asian consumers responded to lower prices by adding to their hoards of jewelry and bullion." Another way of looking at it is that precious metals ownership has shifted from weak hands (speculators, hedge funds, etc. ), who only care about chasing price trends, to strong hands, who will not be trading out of their holdings. People generally buy gold coins and jewelry in order to hold them as core family assets, not to speculate on price movements. This gold isn't going to come back into the market unless much higher prices incentivize some people to sell, though a great many never will sell regardless of price. We are now in the favorable period seasonally for precious metals. Demand from Asia as well as jewelry demand in the West usually picks up in the fall heading into the holiday season. Favorable seasonality didn't stop prices from falling last year, to be sure. Seasonality can't be counted on every year. But with gold and silver prices having bounced off their most deeply oversold levels in years, the technical setup for a seasonal rally into early 2014 looks promising. And if a "black swan" event were to roil the over-leveraged futures markets (something that is impossible to predict, but that should be considered as a possibility), the coming rally could be explosive. Order Online or Call Money Metals Exchange at 1-800-800-1865 for Precious Metals Coins, Bars, and Rounds. We Buy Back Too! The feature article was authored by Seth Van Brocklin.